Halyna Gaieva is one of the former “DPR” prisoners who returned back to the government-controlled area after the big prisoners’ exchange of December 27, 2017. Halyna had worked as a nurse at a maternity hospital in Dokuchaievsk, Donetsk region, since 1980. She worked for two years with the “DPR” being the de-facto authorities. Though her family – children and a grandson – left the occupied territory, she did not, staying to look after her 80-year-old mother. In autumn 2016, she was “arrested” on the charges of espionage for Ukraine’s Security Service, and “sentenced” to 10 years in prison. Halyna was serving her term in Izolyatsia – the Donetsk-based art center seized by militants in 2014. In an interview with the Ukrainian media “Glavred” she speaks about the presence of the Russian regular troops in the uncontrolled territory of Ukraine, on what the daily routines in the occupied territory and the life in detention are as well as how wounded “DPR” troops undergo surgeries in the maternity hospital. The interview comes as an eye-opening testimony about the civilian life under the occupation. UCMC publishes an abbreviated translated version of the interview. Glavred: As the events in Donbas started unfolding were you probably thinking of moving out of the occupied territory? Halyna Gaieva: My children did leave. How can I go away if my mother is almost 80? My husband also had an (elderly) aunt living alone. We were looking after her and buried her in late 2015. Moreover, working at the hospital I happened to be in possession of the information Ukraine needed. So, you don’t deny passing on the information on the situation in the occupied territory to Ukrainian law enforcement? Whom on the Ukrainian side were you passing the information to? To Ukraine’s Security Service based in Volnovakha. Over the phone and in person every time when I was leaving the area. I was telling them what they were interested in. I did have access to the information the terrorists were hiding. For example, we had Russians receiving treatment at our hospital. These were not ordinary citizens but the regular troops of the Russian army. I even remember the surname of one of them. It’s Aleksandr Nabiyev. He is from Amur Oblast (Russia). An officer. The guy had his leg blown off. He went on a reconnaissance mission and hit a trip wire. He was worried all the time about what he was going to say to his mother – he intended to serve in the army. A 33-34-year old handsome youngster. He stood out from those “DPR” vagabonds who were walking around in ragged socks, rubber slippers or boots. This one was wearing the uniform, had clean socks and a shining white T-shirt on… What can I say? Was his mother aware of where her son was? She knew he was in service but did not know he was in Donbas. And he was not the only one. We also had soldiers. And all those soldiers had their documents taken away. And when we were receiving such a casualty, they were coming and telling him that he is not on service anymore, he was dismissed the day before, they were saying. The person had already their leg or arm amputated. He was then shouting: “How come I am not on service anymore?” Just like that as it turns out. They had such a practice there. You were working in the maternity unit, how come the wounded were being sent there? Ours was the maternity hospital, and it remained so. However, we had a separate operating room and a dressing unit, we had anesthesiologists servicing the entire hospital. Everything was evident. When active combat actions were on, they were bringing in five-six people at a time. All in grave condition, with amputation. The therapeutic unit was also receiving them. But those were mainly locals and those who were on contract-based service, with alcohol or narcotic intoxication, including Buryats and Mordvins. How did they “arrest” you? They came to my workplace and took me away. Two persons came, from the alleged “operational staff” of the “Ministry for State Security” (“MGB”). Earlier they used to be no one, they did not even have education, they just entered some local “police school”. (It happened) on October 14, 2016. I was in captivity for almost a year and three months. Espionage. I was “a spy of a hostile foreign state working for the Ukrainian Armed Forces in Volnovakha and Mariupol temporarily controlled by the Ukrainian army”. What was “the trial” like? There were me, those who called themselves a “lawyer”, “prosecutor” and three “judges”. They were reading what they had composed. In the end, they asked me: “Do you consider yourself a Ukrainian citizen?”. I said, sure, I do. “What about Donetsk?” they asked. “Donetsk is Ukraine,” I replied once again. “Are you sure?” they checked. “I am. As will you be quite soon,” I said. At my “court trial” there were UN representatives, my children did their best to get them. The Donetsk side was not confirming that they were holding me captive. It was like a jail. The rooms are re-equipped into cells. There are about five similar prisons in Donetsk. They are located at former destroyed factories, mostly outside the city. It was not only used for holding captives, there were many vehicles in the hangars. However, in the eleven months that I was there, they never left the place. The people? At first, there were about twenty persons. Then there came more. When I left there were 55 persons. Ukrainians, our people so to say, were about 20. Out of them, only four got exchanged – me, Liosha Golikov, Sasha Arbuzov, and Liosha Kuskov. “Izolyatsia” is a contemporary culture platform that was founded in Donetsk in 2010 at the premises of a former factory that used to produce insulation materials. On June 9, 2014, armed representatives of the self-proclaimed “Donetsk People’s Republic” seized the territory. “Izolyatsia” then moved to the premises of the Kyiv shipyard where it keeps implementing cultural projects, supporting socially active artists and agents of changes in Kyiv as well as abroad. The center is also a resource for international curators, researchers, artists and other cultural actors. Three years have passed since the premises of “Izolyatsia” were seized by the “DPR” representatives. Soon after it was seized in June 2014 “Izolyatsia” was turned into a militant training ground, weapons and ammunition depot as well as a jail. 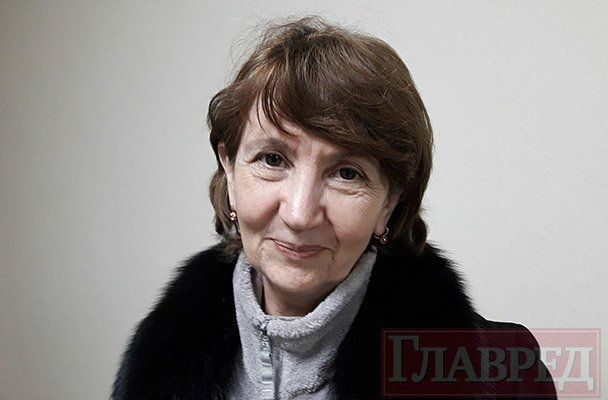 The founder of the foundation Liubov Mykhailova said that the people who were there as prisoners were later describing that they were subject to torture, they were also forced to unload ammunition and weapons that were coming there. Was it cold at the factory in winter? No. The premises were part of the administrative facilities. They were heated – there was a boiler and even a water heater. In winter, it was surely very bad. We had only matrasses, no bed linen or coats. My husband passed me a warm bathrobe, so we were using it to cover ourselves. There were no restrooms, we were taken there only in the morning and in the evening. For the rest of the time, it’s up to you how you deal with it. In spring, the cells were renovated – toilet bowls and air conditioners were installed. How can Ukraine return its occupied territories? I see no peaceful way to do it. Only by force. There is no one to speak to there. They all got used to steal, loot and be dishonest so much that they will not give it all up just like that. Those who were fighting and killing will not get the amnesty. On January 18, 2018, the Ukrainian Parliament passed the Law on reintegration of Donbas. Two hundred and eighty MPs cast their votes for the draft law. The document recognizes Russia aggressor and occupant. The text of the law mentions Russia as aggressor several times and dubs it an “occupant state” once. In accordance with the law, the persons that were taking part in the armed aggression or were members of the occupational administration of the Russian Federation are subject to criminal liability. It contradicts the paragraph 5 of the Minsk agreements that stipulates amnesty by enacting the law that forbids persecution or liability of the persons in their relation to the events that took place in the defined (occupied) areas of Donetsk and Luhansk regions. How strong is “DPR” in people’s minds, of the locals, of your colleagues? Who knows! Everyone is afraid. They live in fear – today I am the target, tomorrow it’s them. If “DPR” fails to get them, then Ukraine will come for them.